Floral design isn’t something we just do – Floral design is all that we do. Using Brides N Blooms Wholesale division, we will order your flowers directly from the farms to give you the freshest flowers possible. Only the flowers YOU choose are used in all your floral designs and decor. Buying your flowers in bulk at wholesale pricing gets you more flowers for less money per stem and you know exactly what flowers will be used in your designs. Our goal is to create the perfect floral package with your flower and color choices, design ideas, to suit your budget, needs and dreams. We build your package using your flower choices, color and design ideas, budget needs, and most of all, your imagination. 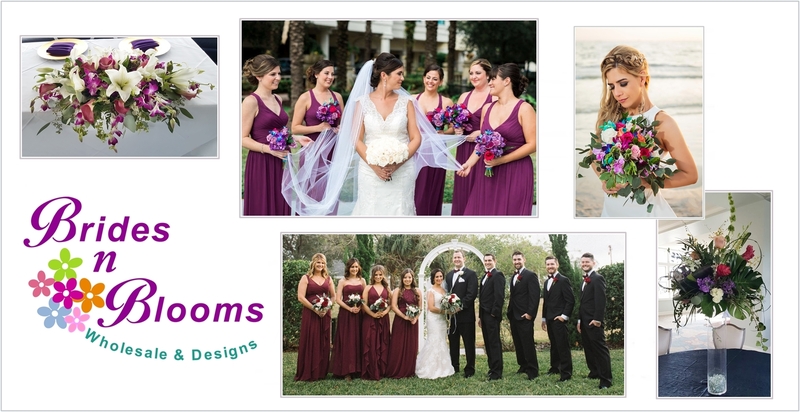 Whether you are local to the Tampa Bay Area, or a destination event, we will work with you via telephone, email, Whatsapp or Skype. That is how we pass our savings over to you. Our design team works to express your ideas and dreams in a creative and individualized fashion. First, by sharing pictures and concepts. Then, by creating each piece with your design scheme in mind. We want to make sure you are confident that we regard each detail of your event with the importance it deserves. DIY BRIDES and EVENT PLANNERS! Check out our wholesale division at BridesNBlooms.com where your wedding flowers are always fresh from the farms to your arms! Let us provide you with Premium Style at Modest Prices, along with the Personal Attention and Excellent Customer Care that you deserve.